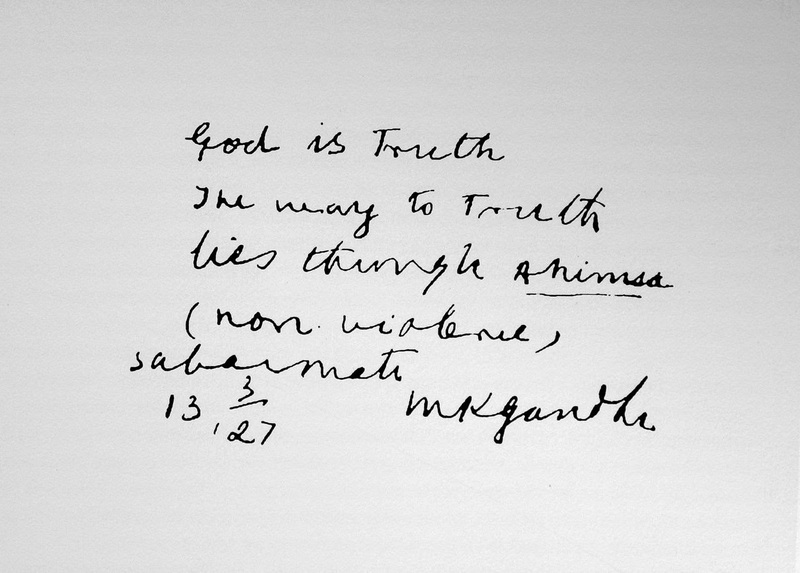 Truth and Non-Violence are the only two real assets that you possess. Nobody can take these away from you. No recession can erode its market value. They are eternal, importantly, practical, assets that are as relevant today as they were in Mahatma Gandhi’s time. In fact, Mohandas Karamchand Gandhi, an ordinary barrister at law, a man as trapped in worldly affairs as you and I are, transformed to become ‘mahatma’ (great soul) because he discovered these assets within him. These two transformational tools that are in our arsenal but we don’t deploy them because we think they are outdated concepts that don’t work. Wrong. I have lived, experienced and learned to report that they work. Big time. And are the only two weapons or resources that we need to survive the vicissitudes of Life. Truth is not just about seeing, saying and doing the right thing. In fact, ahead of that, comes the realization that all Life is equal. This is the whole, the absolute truth. In front of this truth, all else pales in significance, everything is stripped naked. Apply this truth in real Life, in today’s world. You are plagued by worries of job security, of not getting a visa, of an unknown, scary future because you are out of job, of death because you are terminally ill. Now ask yourself why do you want this worry to cede, to go away? So that you can live in peace. To do what? So that you can die in peace. Now, therefore, if there is birth, you agree, you know, that death will happen sooner or later. If all of us have to eventually die, and we know that is inevitable in the future, why worry? Why wonder if we will have a job, a marriage, health and so on? Why not chooseto live in peace even now? The truth is that whoever you are comparing yourself is alsohuman. And so will eventually die too. When you awaken to the reality that all Life is equal, you start valuing Life and begin to live in the present. Non-Violence is not just the absence of physical violence as Gandhi discovered. He found, understood, practiced and taught it as ‘ahimsa’. Which when understood from the original Sanskrit implies that ‘when all violence in the human heart subsides, the state that is arrived at is intense love’. None of us is physically violent at most times. We don’t go about hitting each other or killing people. But there is so much violence in our hearts. We hate people, we hate attitudes, we hurl abuses at each other, we swear on the roads, we wish pain and suffering to those who cause them to us. All this, Gandhi classified as violence. And pointed out that when we are filled with so much metaphorical, verbal, emotional violence__hatred__how can we go to our native state of love? From the neighbor who insensitively parks his car outside your garage to the colleague who plays petty politics at work to the tyrant boss who does not regard merit to the government official who demands a bribe from you to the guys on the street who eve tease your daughter, we are hating someone, somewhere, all the time. When so much instinctive, intuitive hatred fills our Life, where is the scope for love to prevail? Gandhi was inspired by the Buddha’s teaching that ‘when one person hates another, it is the hater who falls ill__physically, emotionally, spiritually.’ Gandhi employed these two tenets of Truth and ‘Ahimsa’__intelligently to first transform himself and then the world. He called this process ‘satyagraha’__which means nothing but ‘truth in action’, and is certainly not some vernacular jargon for describing a protest methodology. Gandhi proved through practice that you can fight any battle, even an army, with just these two weapons. To be sure, he did notsay that we must not fight for our rights, for what is right or for justice. He only said that we fight it with non-violent means and while upholding the truth of our creation as equals. He explained this, in his context, thus: “I do not hate the domineering Englishmen as I refuse to hate the domineering Hindus. But I can and do hate evil wherever it exists. I hate the system of government that the British people have set up in India.” Gandhi’s philosophy, then and now, remains a game changer. The biggest role that pain plays in our lives is that it teaches us patience and acceptance. A post on facebook by Chennai Live 104.8 FM RJ Jane Jeyakumar, that I saw this morning, got me thinking. Jane, it appears, has injured her left thumb (hope she gets well soon!). She hash-tagged her post reporting the injury saying #PainTeachesYouPatience. She said it – and has said it so well! We often think that Life is conspiring against us when we are confronted with pain. It might be through an injury like Jane’s or it can be a graver health challenge or a relationship issue or death of loved one. Through any of these or similar situations, what we must recognize is that Life has no agenda. It just keeps on happening. Sometimes what happens to us meets our expectations. And sometimes it does not meet our expectations. Often, in fact, we are neither ready for nor are we wanting what happens to us. That’s when we experience pain. Who wants a cancer or a pink slip or the death of child or separation from a loved one? But chances of pain happening to us exist as long as Life is happening to us. As long as we are alive. And the only reason, this is my personal, experiential view, pain exists is to make us all better human beings – to make us more patient with and more accepting of Life. I remember in the hey days of our business, when as a start-up consulting Firm, we were clocking revenues of Rs.2 Crore+, I used to be so impatient. I would jump at every situation that did not meet my expectations – a delayed client inflow, a poorly groomed team member, my children waking up late for school or a comma or a full-stop missing in an email. I was nicknamed chiefscreamer(my business title is chiefdreamer) by my team members at work. And then when my Firm went bust and we had to shut down our offices, I learnt acceptance of our new, painful reality – the hard way. I remember sitting in our office one afternoon, as we were winding down operations, tearing up posters of our Firm’s Vision and Mission. We had no place to put up these posters elsewhere or even store them. So they had to be shredded lest they end up in a garbage dump somewhere. It was such a painful exercise. Heart-wrenching for someone like me who loved my Firm so much. But I went through that entire exercise patiently that day – physically letting go of everything that my Firm once stood for and looked like. That’s when it struck me that, over the years of our tumultuous bankruptcy, I had learnt to be patient. I had become stronger in being able to do what had to be done without being emotional about it. Indeed, all my pain had helped me grow and evolve both as a manager and as a human being. The lesson here for all of us is that pain is not a choice. It is inevitable. 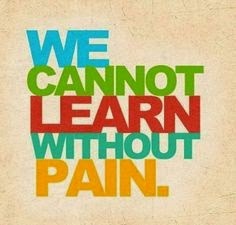 But when you accept and embrace pain, you have the opportunity to learn and evolve from it. If you resist it, on the other hand, questioning its presence and wishing it away, you will suffer. Respect pain as you would respect a teacher. And it will teach you to be patient in and with Life!